The Rainshower System 210 Thermostatic Shower System delivers a revitalizing shower with its soft summer rain function. 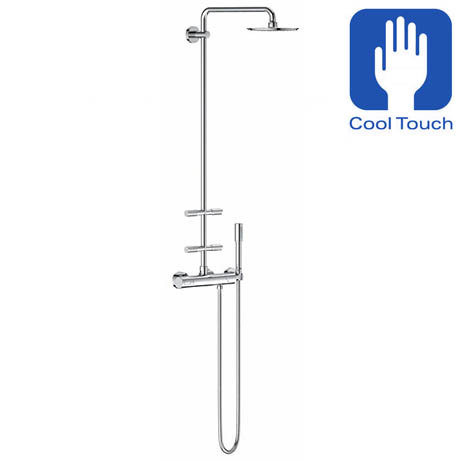 It boasts a 210mm head shower that is mounted on a swivelling arm to create the perfect angle. The four swiveling body jets and the slim hand shower allow a more focused spray. GROHE CoolTouch technology ensures the surface of your thermostat will never be too hot to touch and thanks to GROHE EcoJoy, water consumption is reduced by up to 50%. The shower is finished in GROHE StarLight chrome coating that is easy to clean and durable.